I have always liked the aesthetic of a subway map. There’s something about the web of colorful lines connected by dots trying so desperately to bring order to chaotic systems such as the NYC Subway or the London Underground. As an experiment, I thought it would be fun to try to automatically generate a transportation map given some set of arbitrary data. I then thought one interesting theme to try to convert into a transportation map would be memories I had with other people. 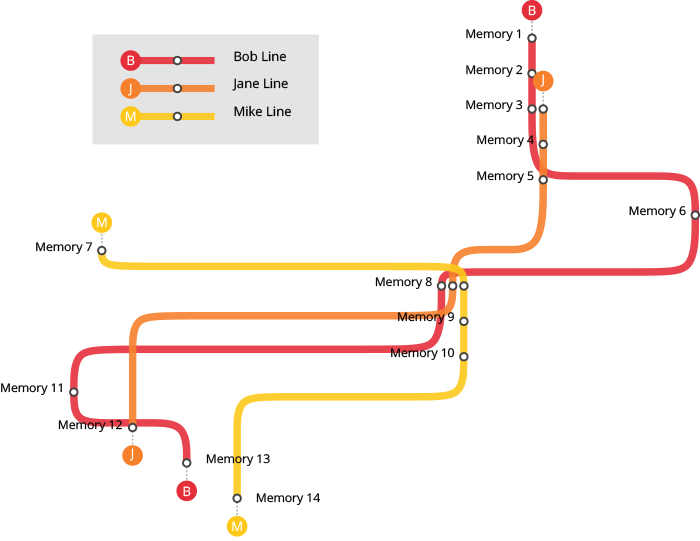 In this case, each person would be treated as a specific train route, each memory with that person would be a stop on that train line, and memories with more than one person would be a transfer point from one train to another. I could also throw in a rule that distance and direction would be equivalent to time, where north is toward the past, south is toward the present, and the earliest memory (station) starts at the top of the map. So I started by chronologically listing out memories in a very simple and structured way: (1) what the memory was, and (2) who were involved in that memory excluding myself. The main challenge here is to determine where each line and stop should be placed so that it would be aesthetically pleasing and interpret and display the data correctly. I executed this process using a list of about 100 personal memories with each memory consisting of 1–10 people. The following is the result. You can also view larger, interactive version of the map here. 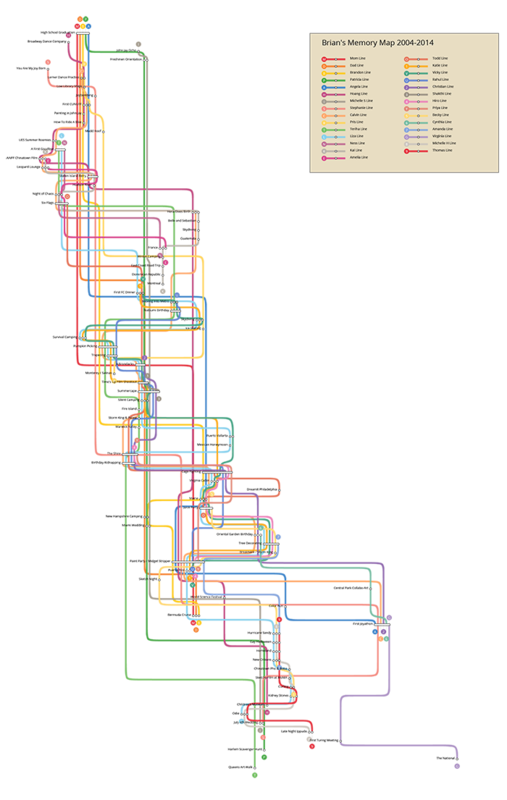 The transit map of about 100 personal memories from the past decade. View full version here.